I will take the opportunity to add my two cents in a tangential area. Happy Belated Canada Day, by the way. There’s a podcast I always wanted to do to discuss the relationship between Dark Shadows and homosexuality. As Wallace said, it’s not a who’s-who matter, re: the cast. That’s been pretty well-covered elsewhere and is more-or-less public record. These were stage actors and writers in Manhattan in the 1960’s. From my studies in theatre history, a community robust with gay men. Last year as I watched the show, the elephant in the room was the issue of homosexual subtext in the story. Because it was my first year running the site, and because I was trying to keep the site from being political, I shied away from that discussion. I somewhat regret that. I don’t think that Dark Shadows was some sort of coded manifesto by design, but it’s an astonishing slice of historical human experience if you take a moment to reverse-engineer the show. 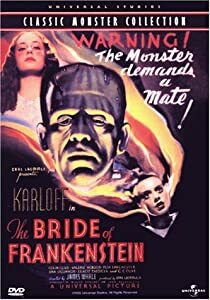 It’s the same with The Bride of Frankenstein. The movie works on its own. And… if you then say, “This was made by a gay man in a time when that was misunderstood, shunned, secret, etc,” the movie becomes political as hell. I’m not even talking about Dr. Praetorius. Karloff‘s character (it feels odd calling him the “creature,” especially in this context) just wants acceptance and companionship in a world of Teutonic rednecks who’d love to lynch him for, yes, how he was born. Which, let us not forget, was by men reproducing without the aid of women. Everything I’ve read indicates that Whale was pretty comfortable with his homosexuality, but even that was after years of struggle and hardship in bigoted poverty and war. And Karloff’s character spends a lot more time just looking for a friend than he does a mate. Whale wasn’t making this by accident, and it makes me very sad that such a world existed and, to some extent, still exists. When I teach that movie, I do teach it from that reading, and the nice thing is that everyone — regardless of orientation — can still identify with it because everyone understands the feeling of difference that Karloff’s character experiences. I think Dark Shadows would have had a lot of subtext even if every actor had swaggered around the set like Denny Crane. Was it helped by the fact that many didn’t? Um, yes. But it’s not really a matter of the acting. In a time when homosexuality was still either a punchline or just a secret, the show has a lot to say in what it doesn’t say. Dark Shadows is a world of secrets and the ambiguous relationship the heroes have with those who know and keep the secrets. It’s a world where everyone has some deeply alienating quality causing them to fear the opinion of others. The characters spend a lot of time trying to assimilate, however their strengths always come from their differences. Going deeper, the two big curses get created by women based on the men rejecting them. Who cures them? Men. (Except for Angelique at the very end, guys like Lang and Petofi are able to help where female healers are powerless.) But before the “cures,” these men have compulsive, nocturnal behaviors for which they have nothing but self-loathing and denial. Barnabas actually hides in a (form of) closet in the daytime and then hides Chris Jennings in a larger closet. Quentin is likewise locked up in a form of a closet until he is released, at which point he poisons the family atmosphere to such an extent that the entire clan moves out. Speaking of Petofi, they don’t even bother with subtext regarding his teasing of Aristede. It’s just text. They are my favorite couple on the show, gay, straight, or otherwise. There is, quite easily, a Ph.D. dissertation to be found in all of this. And I’m talking about what I see as metaphors, not truths about who people actually are or how people actually behave. It’s venting, more than anything else. a racist Star Trek fan.) If you find yourself in those simultaneous categories, you may want to give the show another look. You clearly read the notes but didn’t hear the music.